Moritz, William. "GasparColor: Perfect Hues for Animation." When Adrian Klein wrote his book Colour Cinematography in 1936, he could discuss more than 50 patented systems for shooting and printing color movies - in addition to the simple "tinting" and "toning" that added general overall coloring to most films during the silent film era. Many of these processes involved a two-color system, using some combination of complementary colors, such as orange and blue, to simulate a range of hues, but not a full spectrum (in the case of orange and blue, no real cherry-reds). In the early 1930s several companies made advances toward a three-color system, and the most distinguished of these systems, Gasparcolor, became the prime stock for animation art during the next troubled decade. Invented by the Hungarian chemist Bela Gaspar in 1932, Gasparcolor involved a subtractive-process print film that contained three separate emulsions: magenta and yellow layers sandwiched on one side, and cyan-blue on the other. This meant that Gasparcolor prints could be made from any three-color separation negative: either a single-strip black-and-white film with three successive red-green-blue exposures for each final image, or three separate strips of black-and-white film, each one containing a different red-, green-, or blue-sensitive information. Naturally, the three successive exposures on one film strip seemed preferable, since the prints could be prepared in one single pass (the negative and print run through the printer only once), whereas with three separate strips of original negative (which Technicolor used at that time), the print would have to be rewound twice, with danger of misaligning the colors or increased risk of sprocket, scratch and dust damage. Gaspar's particular chemistry allowed the three-layered film to project brilliant, saturated colors in a complete spectrum of all hues - and the colors and film stock remained very stable over a long time period: Oskar Fischinger's Gasparcolor films from 1933-34  survive still today in excellent shape. Many have judged Gasparcolor the best color film, providing the widest range of subtle and intense color sensations, rivaled only, perhaps, by Technicolor's new three-color imbibition prints, which were being pioneered at the same time as Gasparcolor. Technicolor, however, had simultaneously developed a camera system, while Dr. Gaspar had none. He contacted Oskar Fischinger, who had come to be known as "the wizard of Friedrich Street" (the center of Berlin's film industry) for his cleverness in producing special effects by inventing new techniques and new machinery to make the impossible visible. Fischinger engineered camera mechanisms for Gaspar, which synchronized the camera shutter with a wheel containing three color-filter segments that would rotate to make the three successive cyan/yellow/magenta exposures. This meant, however, that the camera would be shooting 72 frames-per-second instead of the normal 24 frames-per-second, and each cluster of three frames would have to contain the same stable shape information. If an object were moving too fast, its difference in displacement in three successive frames would cause fringes of red, green or blue around the edges of the object. Relatively slow or still movements, however, could be filmed in "real time". 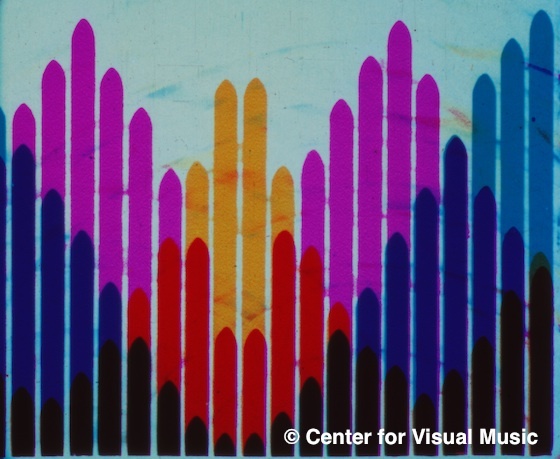 Fischinger himself prepared the first tests for Gasparcolor, and presented the results for the first time publicly at the Third International Color-Music Congress (Farb-Ton-Kongress) at the University of Hamburg in the fall of 1933. Dr. Georg Anschutz had convened previous Color-Music events in 1927 and 1930, and published the proceedings, which included lectures by international psychologists, scientists, artists, dancers, historians and musicians on all aspects of synaesthesia and attempts to produce multimedia manifestations that bridged music and the other senses. So, despite the recent coup d'etat by the National Socialist (Nazi) party, the 1933 Color-Music Congress was well-attended, and an enthusiastic audience cheered Fischinger's presentation. He had demonstrated both the three-successive exposure method filming colored drawings and objects, and the three separate strip system, using three previously-animated black-and-white film strips, assigning each one a certain color. For this last section, Fischinger used the film-strips from a 1926 multiple-projector performance that he had designed for the Farblichtmusik (Color-Light-Music) concerts of a Hungarian composer Alexander Laszlo, who wanted synaesthetic color manifestations to parallel his piano compositions. Laszlo played several short pieces over a 30-minute period, most keyed to a single color/mood, but for the climactic moments, Fischinger had used a triptych of five projectors with three side-by-side images and two other images overlapping the joins of these three . After Laszlo's 1926 tour of concerts were over, Fischinger continued to play his multiple-projection piece (somewhat revised and with different, percussion music) under the title R-1, ein Formspiel (R-1, A Form-Play). . Since Fischinger used the actual tinted film-strips from R-1 for his Gasparcolor tests, I re-attached the Gasparcolor segments to the end of the R-1 film when I restored it in 1980 - even though the Gasparcolor rendition must be more dazzling and intricate than the separate-projection original - and somewhat different, since overlapping film projections and dyes would produce some distinctive additive and subtractive effects. In any case, both the three-successive-exposures and three-separate-strips systems produced beautiful color renditions on Gasparcolor stock, and the use of three diverse originals created some exciting color mixtures, as in the opening sequence of Fischinger's Kreise (Circles), in which the circles flying into a vortex assume various colors and textures in response to shapes they pass. Fischinger finished Circles in December 1933  as a commercial for the advertising agency Tolirag (Sound-Light-Ads Inc.) He had wanted to make Circles as a pure abstract art film, but could not get a permit from the Nazi censorship board, which considered abstract art "degenerate." But with the addition of a title at the end, reading "Tolirag reaches all circles of society," it became an advertising film, and as such, was not subject to the same censorship review. Behind the dazzling film print, however, hid technical problems. The density of the color filters coupled with the low sensitivity of the film stock called for an exposure of about seven seconds for each frame of film, or a total of 21 seconds to complete all three color-separation exposures for a single frame of the final color projection print. Although Adrian Klein (the technical manager of the Gasparcolor company in London), a few years later, would successfully film live-action boating on the Thames, the first Gasparcolor tests could only be used for animation - or carefully staged movements that could be acted out very slowly [One sees such a scene at the beginning of Hans Fischerkoesen's cigarette advertising film Das blaue Wunder (The Blue Miracle), when a "live-action" hand reaches in and turns off a light -- obviously carefully posed in successive positions]. So Gasparcolor became the supreme filmstock for animation in the 1930s and early 1940s - used in films by many of the great artists of that period. Oskar Fischinger's 1934 subtly "realistic" cigarette ad Muratti Gets in the Act and his brilliant 1935 Composition in Blue owe some of their success to the chromatic potentials of Gasparcolor. Len Lye's 1936 Birth of the Robot, Rainbow Dance, Colour Flight and Musical Poster No. 1 (1940) used Gaspar. Claire Parker and Alexandre Alexeieff shot 19 commercials in Gasparcolor, including the 1934 puppet Sleeping Beauty and the dazzling 1935 Top Hats on Parade, with rainbow spectra of silk-sheen hats dancing. Jean Painleve, best known for his scientific documentaries, spent three years making a 13-minute Gasparcolor clay animation of a Bluebeard operetta, employing a sculptor Rene Bertrand and his three children, whose small fingers could more easily make delicate changes in the clay; finished in March 1939, it hardly had a chance to be seen before the outbreak of World War II. George Pal, a Hungarian refugee working in Holland, shot eight puppet animations in Gasparcolor, including the celebrated 1934 ad for Philips radio Ship of the Ether and the 1935 children's story Ali Baba and the Forty Thieves. Gasparcolor Ltd. London also acted as agent for these animators, passing on to them commissions from companies which wanted color advertising films, such as the British firm Parke Davis, who manufactured a pink-colored toothpaste, Euthymol, and wanted a commercial film that could show their product in its correct color. Gaspar got Oskar Fischinger to animate Pink Guards on Parade in 1934 - which showed spirals of pink toothpaste squeezing out of their tubes, rolling across a landscape and going skiing on toothbrushes. Len Lye made a most imaginative use of Gasparcolor's possibilities in his film Rainbow Dance (1936). Here he (like Fischinger in the first Gasparcolor tests) made full use of the three-separation negative potential by assigning different live-action and animation images to various yellow, cyan and magenta exposures. In one case he staggered the same live-action footage of a tennis player so that colored after-images linger behind the man's gesture. In other sequences he placed several different images on each color filter to make a complex layered composite image, corresponding to the traveling mattes that usually would have to be made with tedious and expensive optical printing. Fischinger also planned what would have been an interesting and unique use of Gasparcolor. His 1934 Quadrate (Squares) consists of a loop of 271 abstract paintings of layered squares moving toward (or in reverse, away from) the viewer. He intended the three-color-separation negative of these squares to be printed in different color combinations by switching the color filters and the order of the exposures for each repetition of the images, thus producing infinite color variations on the same balanced composition of square shapes - an uncanny foreshadowing of Josef Albers' later "Hommage to the Square" painting series. Unfortunately the Nazi censorship against "Degenerate" abstract art prevented Fischinger from shooting Squares as he had planned. The Gasparcolor process itself also became in many ways a victim of the Nazi regime. Bela Gaspar fled Germany, and reestablished his firm in London in 1934. The Gasparcolor film stock was manufactured in Belgium by the Gevaert company. So high was the feeling against Nazi Germany that one of the Gasparcolor executives, a Mr. Zukmann, felt obliged to write "Hungarian" behind his name on the company letterhead. And Adrian Klein, who was born in England, son of London's pre-eminent Victorian and Edwardian music critic Hermann Klein (also British born in 1856! ), felt obliged to change his name to Adrian Cornwell-Clyne to emphasize his English nationality - and his distance from German roots. Gasparcolor maintained a simple business office in Berlin until 1935, when the chief employee there. Mr. Burmester, depressed by the worsening situation for himself and his Jewish wife, committed suicide by jumping in front of a train. Meanwhile the Nazi Germans brazenly stole elements of the Gasparcolor patents to create their own Agfacolor three-color system, and when Germany invaded Belgium, Gevaert produced no more Gasparcolor stock for foreign "enemy" countries. Until Bela Gaspar fled to Hollywood and made other arrangements with American film companies to produce stock for him, filmmakers could not obtain new prints or shoot further films in this process. Fischinger, however, managed to obtain Gasparcolor copies of his films Composition in Blue and Muratti Gets in the Act from the London Gasparcolor laboratories up till the summer of 1939. The displacement of Gasparcolor lab facilities and offices, and damage to the London facilities during the Blitz caused many films to be lost. Painleve's Bluebeard was only restored during the 1990s from prints and original negative discovered hidden in France. Unfortunately, Gasparcolor never managed to crack the market in Hollywood. The Technicolor imbibition process was reigning supreme after such dynamic successes as Gone with the Wind and The Wizard of Oz - and other MGM musicals with fantastic dance numbers. Even one potential major client for Gasparcolor Hollywood, another Hungarian refugee, George Pal, was bound by his Paramount contract to use the Technicolor process for his many Puppetoons. Gaspar finally sold his patents to enrich Technicolor, 3M and other rival processes. Oskar Fischinger, however, completed two films, Allegretto and Radio Dynamics (1943), as a swan song for Gasparcolor - proving once again that this system could yield extremely subtle and extremely brilliant color imagery. Originally: "Le Gasparcolor: une procedure chromatique." Lecture at Musee du Louvre, Paris, October 6, 1995.
. This essay has been edited to correct the dates to 1933-34. Though Fischinger made tests in 1933, and began work on Kreise, research after Moritz's death has proved the Gasparcolor film Kreise was not released until 1934, the same year he completed Muratti Grieft Ein.
. More recent research reveals it is likely Fischinger may have only used one projector for the performances with Laszlo. Fischinger did perform multiple projector performances on his own, after they parted ways.
. No documentation has been found that Fischinger performed under this name, R-1 ein Formspiel. He did use the names Raumlichtmusik and Raumlichtkunst for his series of multiple projector live cinematic performances, c. 1926, and documentation and newspaper reviews using those names exist in the CVM archive. Text and images on these pages are protected by Copyright law (Title 17 U.S. Code). Images (c) Center for Visual Music. Please seek permission from CVM before reproducing text or images.